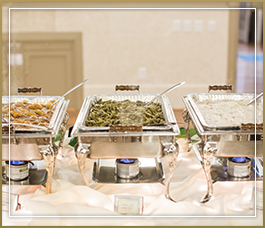 vICTORIA'S cATERING - "THE MOST DELICIOUS BUFFET CATERING in Louisville, KY"
FOR WEDDINGS, CORPORATE GATHERINGS & ALL OF LIFE'S EVENTS! Delicious Food, Excellent Service & Memorable Events! Best Wedding Catering & Corporate Catering in Louisville, KY! 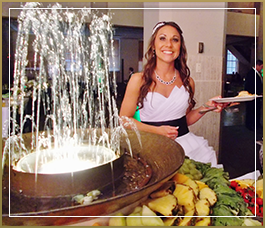 Victoria's Catering provides excellent food & service for all of life's events! Recognized as “2018 Ultimate Resource Guide: Best Local Services & Stores! Victoria's Catering was also selected for 2017 & 2018 Louisville Small Business Excellence Award and has an A+ Rating with the BBB and 100% with the Louisville KY Health Department! 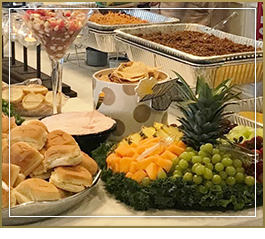 Whether you are planning a small office meeting or a large wedding, our catering company in Louisville, KY, will make it special with just the right type & amount of food, perfect for your group! Ensuring you have everything you need for a flawless event, we offer both full-service & drop-off catering services. Contact us today for a consultation to start planning the details of your menu! Our caterers look forward to making your next event unforgettable! 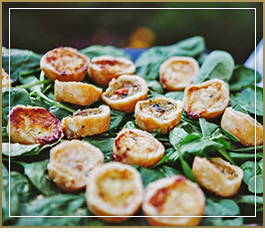 Prepare for your big day with thorough planning and coordination of your catered meal. Let us do the work! Tell us your vision & let us take the stress out of the process! The boss said you are in charge – so let’s make it happen together! Partnering with Victoria’s Catering and our Business to Business Corporate Catering Services will deliver a crowd pleasing meal they won’t soon forget! Planning a special event for a loved one? Let us make it an event everyone will be talking about! To see more examples of our work, please view our gallery page. See how we can make your next corporate event or wedding a memorable one with our unique catering displays. Victoria grew up in a warm and embracing family that loved to cook and entertain in her hometown of Louisville, KY. Early on she developed a gift for hospitality and after years of serving delicious meals for family and friends, Victoria decided to turn her passion into a business. In 1998, she opened “Victoria’s Catering and Specialty Dining”. The business’ first paid catering event was over 400 people and word of mouth spread, leading to catering weddings and corporate events. Two years after opening “Victoria’s Catering and Specialty Dining” she expanded the business and opened a second restaurant at Jefferson Community College. A few years later, with careful thought, planning, and countless prayers, Victoria decided that Catering was where she found true enjoyment. In order to concentrate solely on catering events, she closed all restaurant aspects of the business. Her God-given talent for preparing food and creating recipes can rival top chefs and has set her apart from others who have vigorously spent hours training in prestigious culinary schools. While they were studying, she was already doing what just came naturally. Fine tuning her skills and expertise has continued through her 20+ years of executing flawless events. Because her heart is in everything she does, the tireless hours she puts into every event is counted as a joy to her. It is evident in the smile she carries to the end of your event. Recognized as 2018 Ultimate Resource Guide: Best Local Services & Stores! Has an A+ with the Board of Health & is certified to prepare food the way it should be! Testimonies from 100's of brides, corporate & personal customers (including celebrities) that Victoria's Catering is the "Secret Ingredient to Making Their Events Special!" "I tell you the truth, if you have faith the size of a mustard seed, you can say to this mountain, 'Move from here to there' and it will move. Nothing will be impossible for you."